In 1914 popular writer and naturalist John Burroughs arrived with his friend Henry Ford to visit Thomas Edison for the first time at his estate in Fort Myers. Having grown up working on a family farm in New York, Burroughs had long cultivated an interest in nature and enjoyed the outdoors. 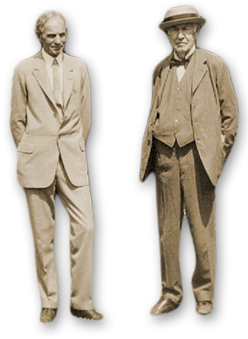 Burroughs was a member of early expeditions with Ford and Edison into the Everglades, where the group enjoyed discovering nature and some time away from hectic everyday life. These early Everglades adventures evolved into camping trips across the country, many of which included John Burroughs. 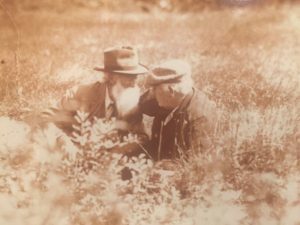 The inquisitive Thomas Edison spent many hours enjoying nature with Burroughs, tapping into the naturalist’s vast knowledge of plants and animals. Burroughs chronicled the trips in scrapbooks which included journals and photos of the self-described “vagabonds.” Visit our “Into the Wild” exhibit in the Edison Ford museum to learn more.